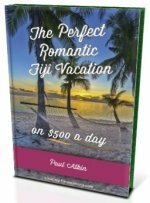 Want to find out about the geography of Fiji? Discover the makeup of this wonderful set of islands called Fiji, or simply just 'paradise' to some people! Fiji, the official name being the Republic of Fiji, is a group of volcanic islands (archipelago) located in the South Pacific Ocean. It's location is 4,450 km (2,775 miles) southwest of Honolulu, Hawaii and 1,770 km (1,100 miles) north of New Zealand. 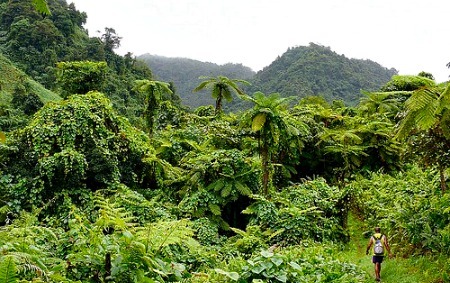 Viti Levu (Great Fiji) is the largest island containing 57% of the land area and around 70% of the population. It has a mountainous interior including the highest peak, Mt Tomanivi. There are four large rivers: Rewa. Navua, Sigatoka, and Ba. 30% of the land area and around 15% of the population. 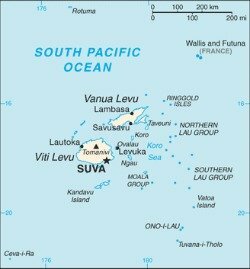 Other island and island groups contain 12.5% of the land area and around 12.5% of the population are: Taveuni, Kadavu, Mamanuca group, Yasawa group, the central Lomaiviti group, and the remote and scattered Lau group which is close to Tonga. There are two outlying regions, Rotuma which is 400km to the north of Viti Levu, and Ceva-i-Ra an uninhabited coral atoll 450km southwest. Extreme points of Fiji, are the locations that are the fartherest points within Fiji in terms of the fartherest north, south, east, and west.